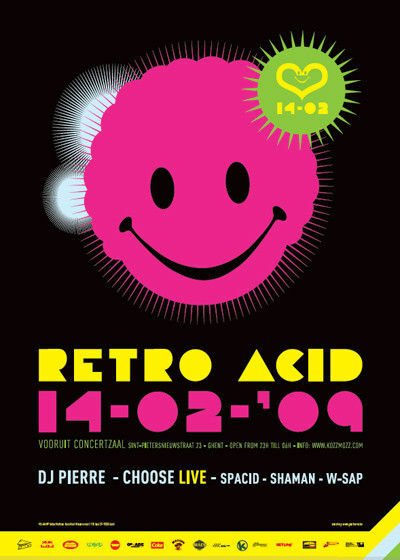 Retro-Acid is Kozzmozz’ second oldest concept and celebrates the joys that we experienced thanks to the infamous silver box, the Roland TB-303 bass machine, the machine that made such a huge impact on electronic music, responsible for several summers of love in the late 80’s and still today is a big influence for many artists. It sure as hell made us dance till the break of dawn and beyond… and we’re still losing minds over this today! In other words, thé party for any 303 fan and its unmistakable Acid sound. For this edition we’re particularly honoured and proud to invite the man who is considered as the originator and inventor of acid house, who created what is known as the very first acid track called ‘Acid Tracks’ as Phuture, released on the Trax label in 1986, none other than Chicago legend DJ Pierre. Playing a major role in the Chicago house scene, the pioneer dj Ron Hardy unleashed this time bomb for the first time in the legendary club the Music Box in the mid 80’s and unknowingly kick started a true revolution. Many other acid tracks followed in different collaborations as well as solo projects. It’s safe to say that DJ Pierre will jack the acid box like no other especially as he’s putting the finishing touches to his first solo album ‘Afro Acid Project’. Second name on the bill is Denmark’s DJ Choose who used to be a real acid aficionado and will provide the harder acid sounds. He released many acid techno records between 1993 and 2000 on various labels such as Drop Bass Network, Acid Assault, Analog USA and many more. Especially for Retro Acid he will bring these tracks live again!